STS-126’s S0007 launch countdown operations have reached another milestone, with the retraction of the Rotating Service Structure (RSS), ahead of tanking on Friday morning. Processing continues to be issue-free, bar the late approval to fly ‘as-is’ with two bent pins on Orbiter Docking System (ODS) connector. Final operations ahead of tanking have been taking place during Thursday, which included checks on Endeavour’s SSME’s (Space Shuttle Main Engines) and the activation of communication systems. RSS retract operations began around 15 minutes ahead of schedule. While tanking is set to begin at 10:30 local time. The latest issues was related to two male pins on one connector (184 pin X4 connector), which were observed as slightly bent a few days ago. This became a Cat II constraint – before finally receiving approval for flight on Thursday. There four connectors equally spaced around the outer circumference of the ODS, although only about a dozen of the pins in each connector are active to transfer power and data (indicator) functions between the shuttle and the ISS when docked. 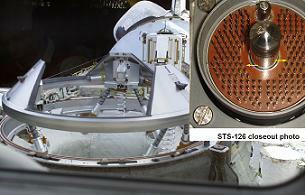 The function of the connectors come into affect when the orbiter docks with the ISS. A set of hooks clamp the connector (male) on the orbiter – with the female hardware – on the ISS – tightly together. This occurs after soft mate when the hooks activate to tightly clamp the vehicles together. The X-connectors make a hard mate during this operation. The two pins in question are likely to be forced back into alignment, as the two vehicles are mated to hard mate. Analysis that cleared the issue to fly showed that no loss of operation would occur, even if the two pins were broken off during mating. One other operation that took place ahead of RSS retract was the “late” stowage of items in Endeavour’s middeck, such as sensitive science experiments that will ride uphill with Endeavour. The middeck payloads consist of the Commercial Generic Bioprocessing Apparatus Science Insert (CSI), which is an educational experiments for students. Other items include: Double Coldbag – a passive low temperature science storage resource; provides cold conditioning for samples when paired with ISS Cold Enclosure Phase Change Material Augmenting Capsules (ICEPACs). “Samples being transported for STS-126 include JAXA Rad Gene, HRP Nutrition, ESA Role of Apoptosis in Lymphocyte Depression (ROALD), and LADA Vegetable Production Unit (VPU). General Laboratory Active Cryogenic ISS Experiment Refrigerator (GLACIER) – a powered double middeck locker, rear-breathing cryogenic freezer which provides transportation and preservation capability for samples (+4 to -95 deg C in air-cooled mode). National Lab Pathfinder (NLP) – commercial payloads in support of the National Lab Pathfinder initiative, is also listed. “NLP-Cells-1: This investigation comprises two experiments. One will examine the effects of space flight on cellular replication and differentiation in cattle cells. The other will determine the effects of microgravity on normal differentiation and function of liver cells and bile duct epithelium (lining). “NLP-Vaccine-2: contains pathogenetic organisms and is using spaceflight to develop potential vaccines for the prevention of infections on Earth. Vegetable Production Unit (Lada-VPU): “Validating VPU Plants, Protocols, Procedures and Requirements (P3R) will optimize hardware and plant growth techniques to allow maximum plant development to occur on the ISS, utilizing the Russian Lada growth chamber.